Reliable method of achieving renal hypothermia during laparoscopic partial nephrec-tomy remains a technical challenge. An accepted practice has been to limit warm renal ischemia to 30 minutes or less, beyond which ischemic renal injury is likely to occur, especially in the elderly or those with compromised baseline renal function. Currently reported techniques of laparoscopic hypothermia include renal cooling jacket, renal artery cold perfusion (9), and retrograde cold perfusion of the pelvicalyceal system through a ureteral catheter (10). At the Cleveland Clinic, laparoscopic renal hypothermia has been performed by the surface contact technique, akin to open surgery. 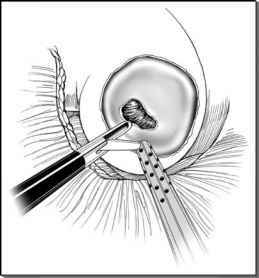 Ice slush is instilled through a laparoscopic port into an Endocatch bag placed around the kidney. Using 600-750 cc of ice slush around the kidney, a nadir core renal parenchymal temperature of 5°C to 19°C was documented (11).